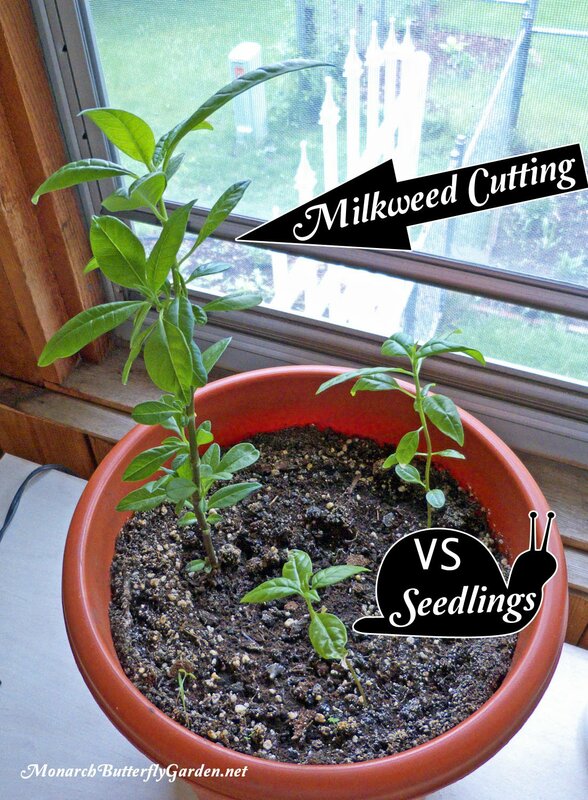 Though seed starting has its place, I never realized all the unnecessary time I was wasting until I started growing tropical milkweed from cuttings. Did I mention our rambunctious four-legged friends?…Oh Deer! While milkweed seeds can do the job, they just don’t measure up to cuttings…especially in the case of annual varieties (for most) like swan milkweed (Gomphocarpus fruticosus), and tropical milkweed (Asclepias curassavica). After your first season starting milkweed seeds, you’ve basically won the ‘milkweed lotto’ for life if you take advantage of your mature plants…you won’t even have to pay taxes! 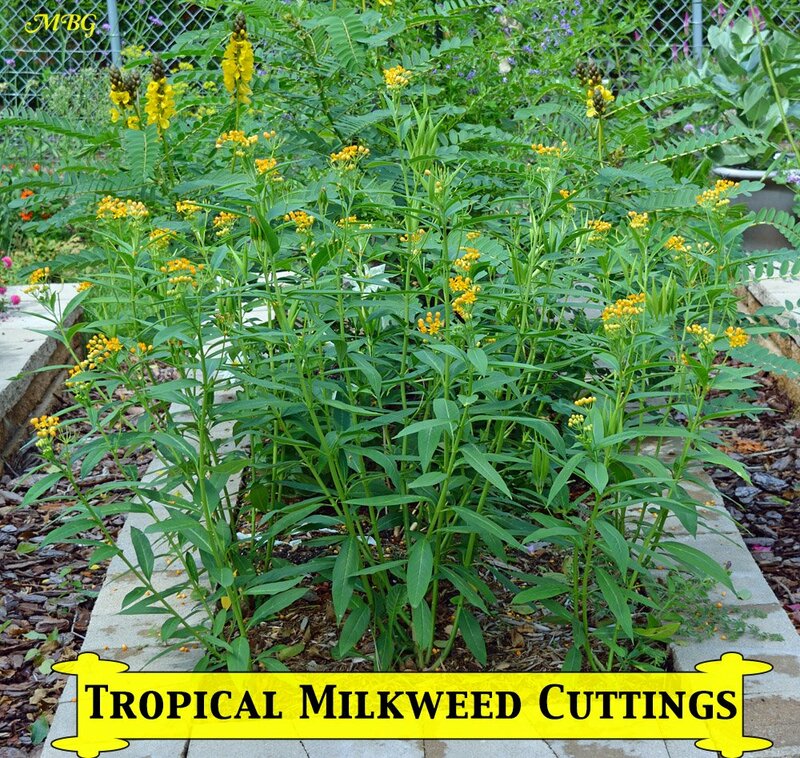 Tropical milkweed is a prime species for winter cuttings since it can be overwintered indoors. I will be discussing starting cuttings in water, but they can also be propagated directly in soil, like some native milkweed varieties. Plant cuttings are the gift that keeps giving…100% free! 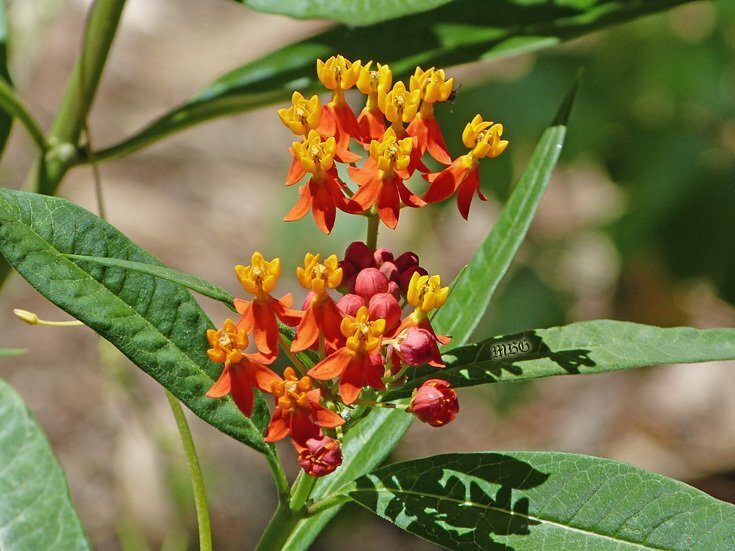 Tropical milkweed (A. curassavica), butterfly weed (A. tuberosa), cuttings can be rooted in water. My balloon plant (G. physocarpus)and swan milkweed (G.fruticosus) cuttings rotted in water, although others have reported success with these varieties. Use gloves or wash hands thoroughly after handling milkweed to avoid getting milkweed sap in your eyes later. This can cause burning and a few unfortunate souls have even had to go to the emergency room for treatment. 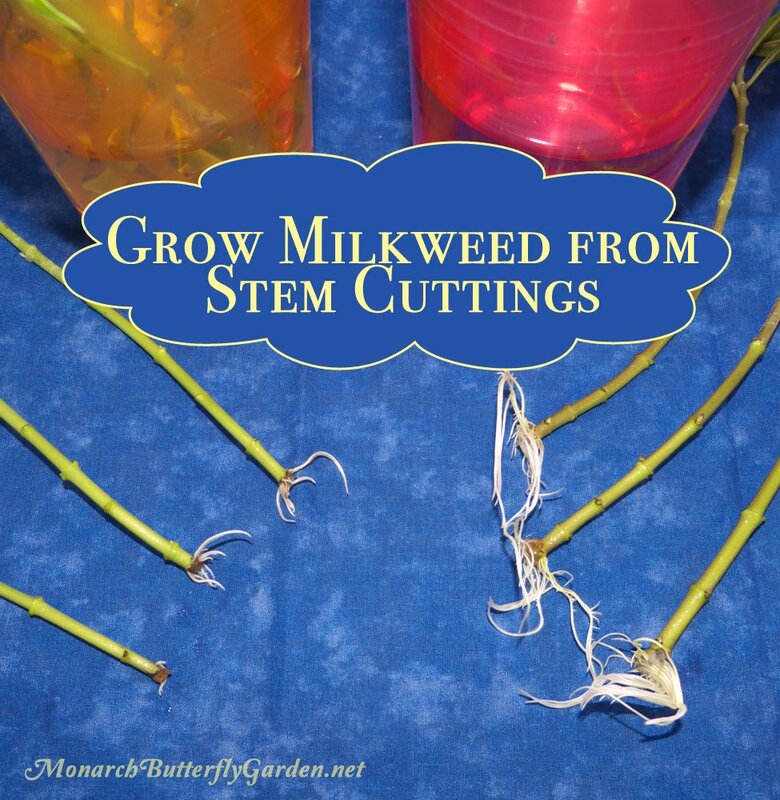 Your stem cutting should be roughly 4″ long or 3-5 leaf nodes. You can take multiple cuttings from the same stem. Speed Tip 3– Using a cloning machine ? We replaced our foam inserts with rockwool cubes because the foam was causing the cuttings to rot at the insertion point. We still use foam to cover the holes where there aren’t any cuttings. Place cuttings in an area away from direct sunlight, but receiving some light. Ours are on a table where they get a couple hours of dappled sunlight every afternoon. This has worked well for root growth. So, a few months after starting tropical milkweed from cuttings, what can you expect?? Zone 6 here. This was my first try at over wintering tropical milkweed plants indoors. For the most part they are doing well. I am going to start some cuttings this week from my over wintered plants. Have you ever tried mixing some of the powder rooting hormones in the distilled water that you put the cuttings in? Was wondering if that would assist in producing roots faster. Also, one of my over wintering plants started to form flower buds. What do u suggest I do with them? Looking forward to another great butterfly season in SE Michigan! I also have 7 new milkweed species I’ve got winter sown- prairie, whorled, poke, purple, tall green, spider, and showy! I’ve tried the way in your video many times and my stems always rot. I’ve used rooting hormone and they just rot. I’ve tried putting them straight into dirt and the shrivel up and die. Why is it so simple for everyone? Hi Romy, we’ve had the most success doing this in the spring. We put the cuttings in our 3-season porch where it gets really cool at night and warm during the day and rotting has not been an issue. We also direct planted cuttings in spring and had success. keep trying! I’m thinking about overwintering tropical milkweed, for the first time, in IL this year. Your demo shows a big plant, which appears to be inside already, for the winter. Can you clarify that for me? I was thinking I would take cuttings of my season-end plants, for next year. Mine are not big, robust plants like you are showing. I planted a dozen or more stems in a couple of pots this year, and they supported some eggs and caterpillar feeding, but they never grew large. Also, in bringing in plants in fall, what do you suggest to treat for OE and aphids, so they don’t overwinter with the plants? Thanks! My potted Swamp and Tropical are thriving on my balcony so I know I can grow more. Unfortunately, like you, my Swamp cuttings rotted in water. I’m now using sand and a large, plastic bottle. Trying my first TROPICAL cutting in water. I know if I succeed with the Tropical I’ll definitely have to pot it up since it’s still summer but how long before I START seeing roots? In other words approx how long before I see the first hint that it’s working this time ? Hi Vickie…maybe 2-3 weeks? 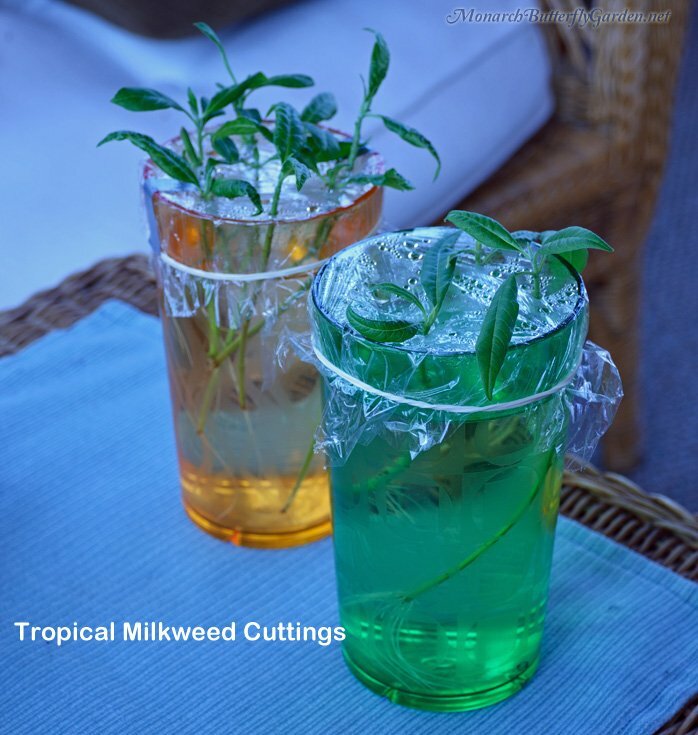 During the summer months, it might be quicker to use rooting hormone and plant the cuttings directly in soil. good luck! Hi there- I am a teacher interested in trying to expand my milkweed supply before the fall migration and the butterfly project I do each September. Sometime Monarchs arrive on their own; sometimes I have to buy eggs. Regardless, I feel I need more leaves for the upcoming project. It is now July 18, and I have a dozen good plants. My question is about snipping now to propagate additional plants for this season. Worth the effort? Will snipping my current plants make them bushier for my project and the snippets may come in handy? Hi, I am in eastern North Carolina. Lots of strong sunshine here! How do I directly plant in soil? Just snip cutting, drop it in some good soil, keep it watered and that’s it?Would a week in root stimulator help before putting in the ground? This is my fourth year of having Monarchs in the classroom, and this past year fewer tropical milkweeds self-seeded. I will now always winter over some of my best plants offspring! One last question for today. When I take the cuttings, will the sunshine increase root growth if the plants have been in full sun, whether in water or in the soil? If using the direct soil method, should I put the cutting in a starter pot out of direct sun or just sink that sucker in the hole that is to be his forever home? Hi Lisa, we use rooting hormone powder. When I’ve done this in spring, it was in the sun, but in the summer partial shade might be better. I would try both and see which works better. Newbie here, I’ve had ZERO luck growing from seed, but have a few plants purchased from a local nursery. Can I grow from cuttings: narrow leaf milkweed (fascicularis) in Southern CA? I have a question. Do my cuttings need to have leaves on them to start this process? I am running low on milkweeds and currently have no leaves, only milkweed stems sticking out of the ground. Hi Keara, they will start growing without leaves…sounds like the monarchs have been keeping you busy! Just a word of warning. Milkweed plants are toxic to cats if eaten. If overwintering or trying to start cuttings make sure the plants cannot be eaten by your furry friends. I know from experience. I left some plants unattended by mistake for a few minutes and I ended up spending over 400 dollars to have my two cats treated for milkweed poisoning. This is my first time growing tropical milkweed in St. Louis Mo. from purchased plants and had really good success, about 30 Cats! Now I’m going to try cuttings (estimating about 70+ cuttings) to plant next spring so what is the lowest nightly temperature they can stand before it gets too cold here? When I do the cuttings I won’t be able to put the new plants outside for about 4 months. Do I have to transplant newly rooted cuttings after so many months in soil and how do I keep them from rotting in their soil containers? What’s the best containers to use for so many cuttings? If you take cuttings in spring, then you can just direct plant in spring…rooted stem cuttings are much sturdier than seedlings. So are you saying if I would bring in about 70 cuttings before it freezes here pretty soon that they won’t do any good? I would have to dig up the plants to bring them in and wouldn’t there be tiny bugs that will fill the house. Then I wouldn’t have enough cuttings from those few plants to do any good cause the plants I had this year were running out of leaves for the 30 cats I had. Working with help from the Insectarium here in Philadelphia I took late fall cuttings from the few tropical milkweed plants I had and overwintered them in water after first dipping the ends in a rooting enhancer. Kept them in water (several changes) and they developed fantastic roots. Last week planted them in the garden and they are all doing well. That’s great Ernest…sometimes the stems rot if you leave them in water that long, even if you switch out the water. congrats and good luck with all your plants! Hi Tony, Thanks for the well done video. For those of us in zone 5, is there anyway of preserving the plant in order to take the cuttings in Spring? I have a beautiful Tropical Milkweed growing in a large planter that’s too big to keep inside all winter and I’d like to take cuttings to put aside until I can root them in Spring. Is there any way to do that or should I just take the cuttings now? 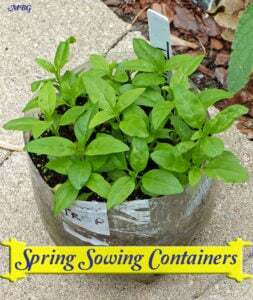 Will the plants grow too fast to keep in a milk jug sized container all winter? I’ve heard reports of tropical milkweed coming back in colder zones, but nothing verified. You could always try leaf mulching and see if any survive. good luck! Hi Patti, tropical milkweed typically responds well to being cut back…think of what the munching monarchs put it through. good luck! Hi = my name is Kevin Roling. I am a teacher at Bettendorf Middle School in Bettendorf, Iowa and I am working on a project this year to grow milkweed in my classroom. 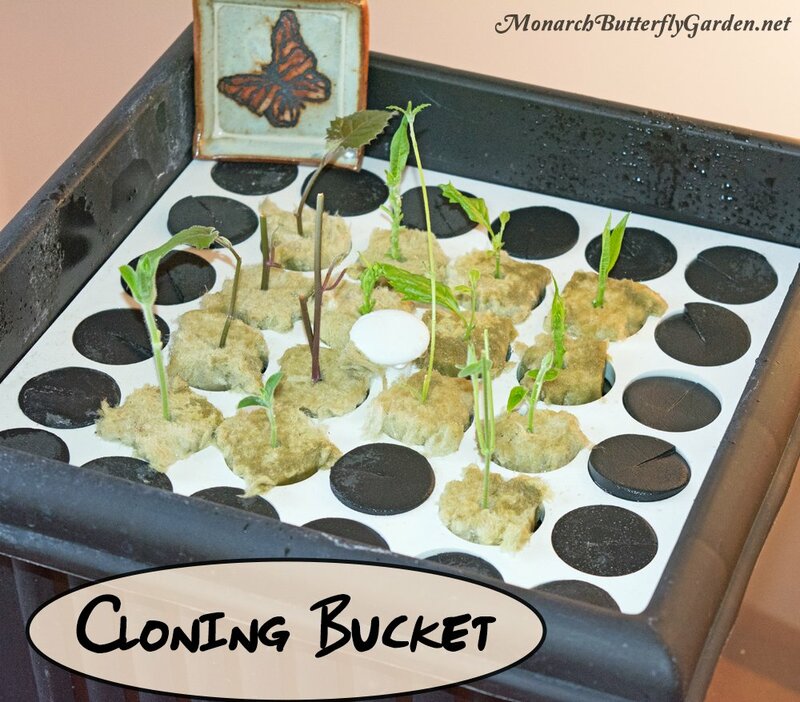 I have three tower gardens so I am considering growing the milkweed aeroponically. Hi Kevin, what a great school project for your class. I would suggest finding someone from a local nursery with first-hand experience growing aeroponically. Appears Monarch laid eggs on Geranium plant (slightly touching) Milkweed plant outdoors in my potted plant, Manhattan Beach, CA. In addition to black dots (on Geranium, several green bugs, and several small “eat holes” on flower of Geranium. Will they survive? I just moved plant away from Milkweed. Hi Debbie, the reason monarchs usually ‘disappear is because of the long list of predators in the butterfly garden. I noticed lots of people mentioning their cutting rotting. If they will add an air supply (aquarium pump will do) the water will not sour and the plants won’t rot Works really , really well. Thanks Leslie, I’ve used a pump before with success, but also had rotting stems. I started cuttings (without an air supply) in our porch this spring, where there’s a large temperature fluctuation. I only brought the cups in if it got below 40°. They rooted very well in these conditions with no rotting stems. I also started seeds in spring sowing containers, which promoted much earlier germination compared to direct sowing. Once I get them rooted in water, and I want to transfer them to pots, do I use regular potting soil? Or do I use peat with perlite? Thank you! I plant ours directly in the garden or in regular all-purpose potting soil. I have tropical milkweed from which I took cuttings and rooted them quite successfully in water. I was so ecstatic! But then I planted them outdoors, and none of them grew. They did not die, but they did not grow either! They stayed green and with the 2 same leaves on them as when I took the cuttings. Any suggestions? Should I try in the future to put these in pots instead of the ground? We have mature milkweed plants in that same area that do fine. If they didn’t die, are they still there? If so, give them time. Tropical usually starts to take off in the heat of the summer. Other ideas would be to amend the soil with compost or try planting in a different microclimate of your yard. Our tropical milkweed has grown best in partial shade. Yes, they are still there, and have been there over a year! They don’t die, but they don’t grow either. I’m curious about that plant in your video. Did you bring it indoors from last year or is it a new plant from a green house?? Also, I have some questions regarding milkweed seeds. Last summer was my first attempt to really grow milk weed and I had great success growing many beautiful common milk weed plants (from seedlings I received in the mail). I collected many seeds but I didn’t realize I had to cold stratify the seeds. A few days ago I put some seeds in wet paper towels, inside plastic bags, and then into the fridge but am afraid I started too late:( I also put some in potting soil outside a couple weeks ago but the wind blew it over and everything got mixed up (however, I put all the planting mix back into the seed growing containers and am hoping for the best). As I still have 100’s of seeds remaining from my collection I’m not sure what to do with them. Should I try soaking them and then plant them indoors and/or outdoors? I could put them in the plastic green house that I put on my deck (it receives a lot of light) and hope for the best. 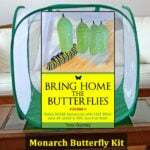 I really want to grow as many plants as possible for the Monarchs. Even though I had lots of plants, I did not see any monarchs last year…..I was sooooo sad:( However, at least I had dozens of hummingbirds and other pollinators last year. Please help me figure out the best way to utilize my remaining seeds. Many thanks, I look forward to your reply. Hi Susan, no greenhouse, just our cool basement with a south-facing window. The more sun your tropical milkweed plant gets, the healthier it will look and could even flower indoors. However, this is not necessary. My goal is just to keep them alive until I can move them outdoors in spring. As long as you can cold stratify your A. syriaca seeds for about a month, your germination rate should be good if the seeds are good quality. Good luck! Can milkweed be rooted just in potting soil like coleus? I have a milkweed that is almost 3′ tall and I’d like to start some new cuttings. I had monarch activity in January and the leaves are just now starting to come back. When would be a good time to do this if it’s possible? Hi Deanna, I know tropical milkweed can be started in soil but we don’t use this propagation technique in our northern region. Some use rooting hormone to promote faster growth. I’m assuming you are in a warm weather region. If the risk of freezing temps has passed, you should be good to go…good luck! Thank you for all of the information you are giving us. I have a question about my milkweed plants also. A lot of my leaves on my milkweed plants have black spots. Even some of the stems have the same black spots. There are flowers on these plants as well. Do I need to uproot the plants & purchase new ones or can I save these plants? I’ve searched everywhere to find an answer to this question. It looks like you may be able to actually tell me what to do. I would like to raise more Monarch’s this year but don’t know if these plants are healthy enough to do this. Please help me with my problem. Thank you. Hi Maria, sometimes cutting back affected stems and leaves helps. In continuous growing regions there are more issues with fungus..especially during times of the season when there is excess precipitation. Make sure the plants aren’t being overwatered…good luck! Hi Maria, I hear a lot of people that have issues with their tropical milkweed in Florida during periods of heavy rain. My understanding is that the plants typically recover, which is why so many people in Florida choose tropical mw over some of the natives. good luck with your plants! Hi Judy, hydrogen peroxide kills fungus gnat egg/larvae in the soil, but it probably won’t stop whatever is eating your milkweed. Before you look for a solution, I would definitely figure out who the culprit is first…good luck! PS…keep in mind insects aren’t the only pests that eat milkweed. Rabbits, mice, and deer can also be potential suspects for milkweed munching. I was reading your information on tropical milkweed cuttings and the information on using hydrogen peroxide on plants. Can this be used on tropical milkweed that the leaves have been eaten to where there are leggy stems and only a few leaves at the top. Will the Hydrogen peroxide eliminate what is eating the leaves. I am in Central Florida and still have Monarch caterpillars (limited). I have a lot of Zebra Longwing caterpillars (on passion vine) and Polydamus Swallowtail caterpillars (on Dutchman pipe vine) should the Hydrogen peroxide mixture be used on those vines also. I am desperate to know what could be used on the milkweed to eliminate what is ruining the plants. I have taken a lot of cuttings and have some in ground and a lot in water. Thank you for the video on how to do cuttings, I had no idea it was simple (or at least it looks so simple)! Can’t wait to go out and try this this afternoon! This plant is considered sacred in Hindu religion.Offered to lord Hanumana. Can you help me by sending cuttings to my address? 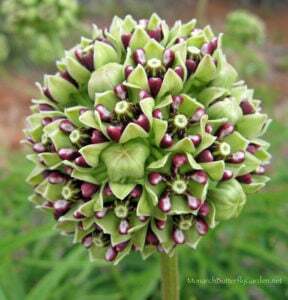 Hello Shirish, if you can’t find plants locally, you can buy seeds/plants online from the resource links at the bottom of my tropical milkweed page. Once you have plants, you will have an endless supply of cuttings. good luck! Hi Z, you have a year round population in Houston…the migration is pretty much finished for the season. It’s still a good idea to cut back milkweed to stop the build up of OE spores. You can stagger the cuttings so there will always be some milkweed available throughout the winter. My question: It is Day 25 of planting a few dozen seedlings using the pods/seeds I removed from my Tropical Milkweed plant. In general, they appear healthy. I noticed the first true leaves just beginning to emerge from between the cotyledons, but I also noticed a few of the tips of the cotyledons were black. Is this an issue? If so, how do I correct it? Hi Tony – Apologies for my late response. Thank you – I will try that. What’s your recommendation on when to cut? Do I just cut and not look to see who’s around? Lol! 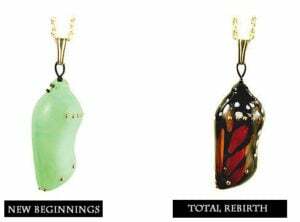 I looked yesterday and the cycle was starting again with about 2 very small Monarch butterflies. Should I start to learn how to take the few in that I see and raise them inside so I can cut the plants down? I’m in Houston and this week it is pleasantly warm. But the temperatures can swing wildly week to week in the fall. BTW – I am using your cuttings method on another plant!